The division of Korea in August 1945 was one of the most consequential foreign policy decisions of the twentieth century. Despite the enormous impact this split has had on international relations from the Cold War to the present, comparatively little has been done to explain the decision. 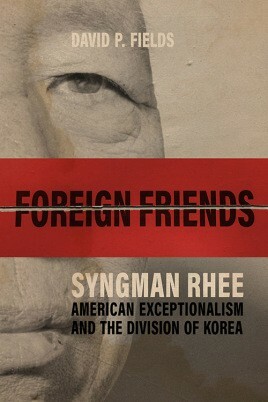 In Foreign Friends: Syngman Rhee, American Exceptionalism, and the Division of Korea, author David P. Fields argues that the division resulted not from a snap decision made by US military officers at the end of World War II but from a forty-year lobbying campaign spearheaded by Korean nationalist Syngman Rhee. Educated in an American missionary school in Seoul, Rhee understood the importance of exceptionalism in American society. Alleging that the US turned its back on the most rapidly Christianizing nation in the world when it acquiesced to Japan's annexation of Korea in 1905, Rhee constructed a coalition of American supporters to pressure policymakers to right these historical wrongs by supporting Korea's independence. Following the attack on Pearl Harbor, Rhee and his Korean supporters reasoned that the American abandonment of Korea had given the Japanese a foothold in Asia, tarnishing the US claim to leadership in the opinion of millions of Asians. By transforming Korea into a moralist tale of the failures of American foreign policy in Asia, Rhee and his camp turned the country into a test case of American exceptionalism in the postwar era. Division was not the outcome they sought, but their lobbying was a crucial yet overlooked piece that contributed to this final resolution. Through its systematic use of the personal papers and diary of Syngman Rhee, as well as its serious examination of American exceptionalism, Foreign Friends synthesizes religious, intellectual, and diplomatic history to offer a new interpretation of US-Korean relations.